Dutch designer duo Stefan Scholten (born in 1972) and Carole Baijings (born in 1973) have recently been garnering attention with designs between design art and product design that have also playfully departed from the often excessive conceptual focus of Dutch design. 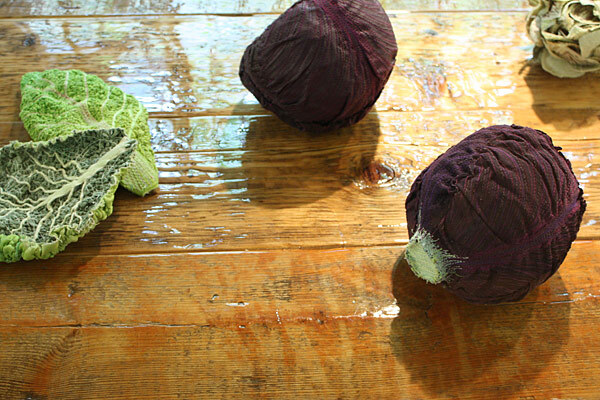 Scholten & Baijings turn vegetable forms made from fabric into objects of communication for the table and add subtle patterns, colors or layers to their designs. The designers, based in Amsterdam, became known with their "Colour Plaids" as well as projects such as "Truly Dutch", for which they reinterpreted traditional Dutch furniture and commodities. 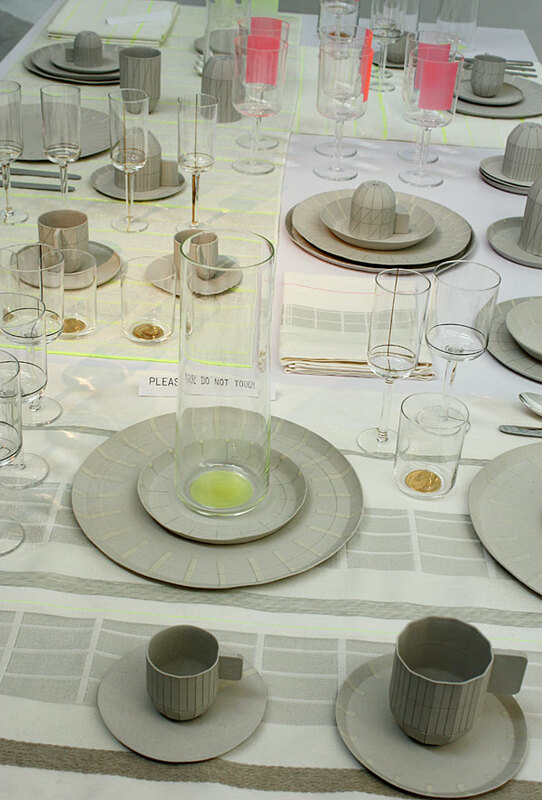 With the project "Total Table", at "Object Rotterdam" and in Milan they presented a complete design for a laid table. Also in Milan, they presented designs for the first time with Established & Sons that have now progressed down the road from first idea to ready for production by a major furniture manufacturer. Markus Frenzl met up with them in Rotterdam and Milan. You presented your "Total Table" project in February at "Object Rotterdam", a trade fair for "autonomous design". You focus a lot on traditional craftwork and history in your work. Do you actually see yourselves as industrial designers? Stefan Scholten: Yes, we really are designers, but we like the artistic process, working in a studio. The classic design process from the design through the model and prototype to mass production does not work the same way today. We have to find out where we come from and what we want with design. This is also what we want to convey to our students at the Design Academy Eindhoven: You can find your own material, your own color scheme, your personal approach. The idea of "free design" however, which is somewhere between art and design, is not what we are striving for. 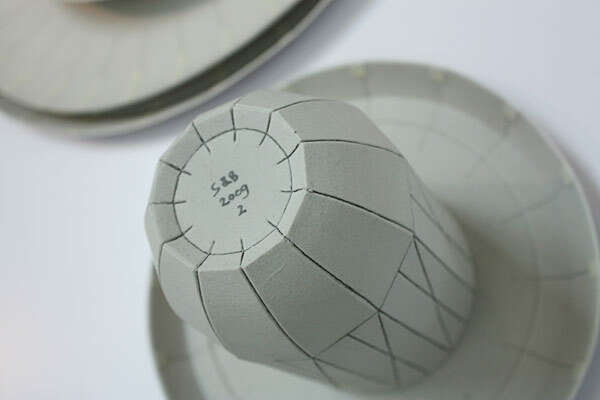 The challenge is to bring designs to the mass-production stage precisely as they are in the model stage, for instance, to retain the appearance of paper in the end product. Can designers afford, given the crisis, to move away from industry requirements? Stefan Scholten: The design of one-offs went against the grain of all the standard design products; people needed products made by hand, with a personal signature. That started around 2000; people were buying everything, there were no limits. Those days are gone now, either because of the financial crisis or perhaps a change in mentality, but fortunately there is still a great deal of interest in collectors' items. However, now only a few wealthy collectors can afford the projects we presented last year at the Zuiderzee Museum. Carole Baijings: The great thing about a project like "Truly Dutch" is getting the inspiration and developing the techniques that we can then also use for large series. I think that as a designer, you need jobs like this to develop that which you can use later in mass production. Does a freer approach also lead to a new understanding of design? Do you see your work as an expression of social responsibility? Stefan Scholten: We are conscious of social issues and very serious about including themes like durability, environmental aspects etc. in our designs. But you can only achieve something when you produce a design on a large scale and encourage people to keep the product longer. Because the need for the products is still there. A poetic approach also presents a way to raise awareness of design - another method, instead of just using the choice of materials to tackle environmental problems. Hella Jongerius once said she was not interested in the division of art and design. Do you still see a clear distinction between the various disciplines? Stefan Scholten: For us, our fabric vegetables represented the point when we started seeing the designer more as a craftsman. We wanted to find out if the intensity of our work would change if we did everything ourselves in our own studio. Of course, now there are people who say: "Why vegetables? Is that design? What can I do with them?" 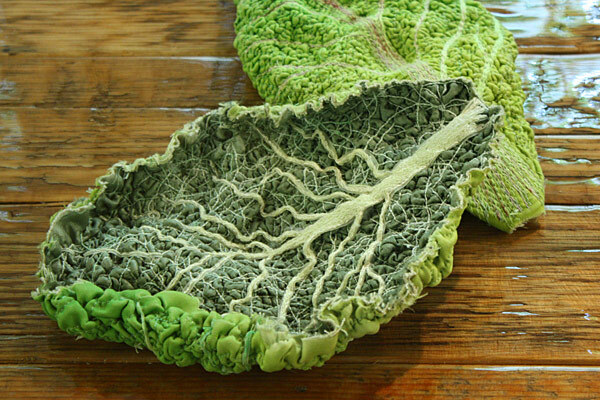 And what function do your vegetable objects have? A similar function to the table centerpieces of old? Are they decorative table ornaments? Carole Baijings: We call them "conversation pieces": If you sit at the table in a group, sooner or later you will start talking about the objects on the table. So in this sense they have a function. However, for us it was more important to find out how we can work with textiles and transform the material; we worked on this project for three months. If you transform a design object, people say: "Aha, that is a chair". Which is why it is so much more interesting to make an object that is not functional. Stefan Scholten: So in this regard we agree with Hella and don't worry at the time whether we are designers or artists. Even if you want to go for mass production, as a designer you always have to conduct a kind of independent study. Just as a pianist has to practice playing piano every day, we designers have to research every day. Only ten or 15 years ago this research work would not have sold. Stefan Scholten: Yes, it is new, that's true. It depends on what the market requires. 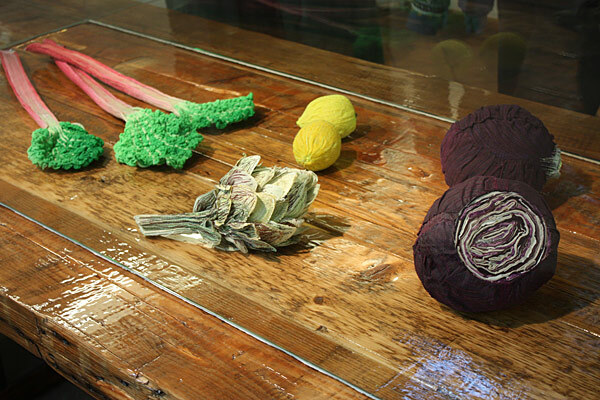 Our vegetable works have sold incredibly well and that's a good thing too - we can use the money to make new things. 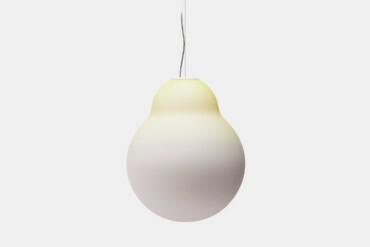 For in the Netherlands we only have two design galleries at the moment, "Vivid" and "PriveeKollektie". We don't have galleries like "Kreo" in Paris or "Moss" in New York, which commission designers and also pay for the production, and then buy exclusive rights to sales. In this way, they fund a little of the designer's research. That is why we are pleased there are exhibitions like "Object Rotterdam", which focus on niches and different approaches. However, you can also see "limited editions" as an overreaction, a marketing tool for art fairs. The main difference is that a good artist does not intend to have his work produced and sold on a mass scale. With design, in the end money is always a factor. What is the central idea behind the "Total Table" project? 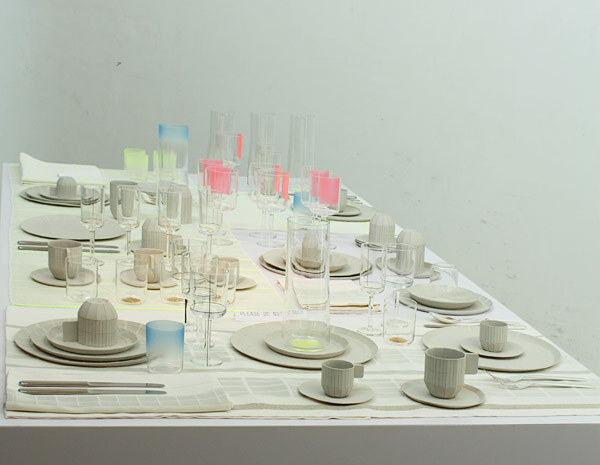 Stefan Scholten: The idea for that came from the Textilmuseum, which had already realized numerous projects with designers and was looking for new ideas for crockery and cutlery designs. 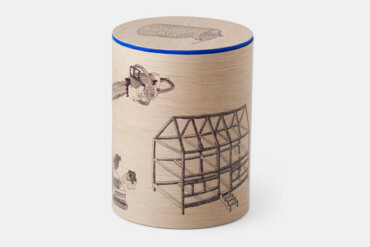 They got companies involved including van Kempen & Begeer, Cor Unum and Royal Leerdam and asked Kiki van Eijk and us to each produce one design for all the things on a laid table, but not the table itself. We started with paper models and soon realized that we wanted to communicate the poetry of the material paper itself. Of course, mass-produced products always involve immense material costs. Paper gives you greater freedom in the design. So for "Total Table", we transferred the appearance of cardboard and paper directly onto the porcelain and also used paper for collages that were transferred onto the glassware and textiles. It was very difficult to do, but it worked in the end. Carole Baijings: We already had the whole table finished a year ago - but only in paper and cardboard! It looked just the same as it does now, although the paper designs are now objects made of the proper material. The appearance and tactile qualities of the paper designs have remained exactly the same in the end products. One of your typical methods is to place strips of color, layers or patterns over your designs. This is very different to classic industrial design approaches, in which the form and not the surface is at the forefront. Are you not worried people will think you superficial? Stefan Scholten: We believe in the durability of a color when we add it to a product. Everyone thinks adding color is easy, but it is extremely difficult. That is why all mass-produced goods are the same color. If you ask a manufacturer if he can use fluorescent yellow, he will say it is impossible, citing problems with intensity, light, availability in large quantities and low demand for such products... Ours is a constant struggle. Carole Baijings: The nice thing is that we never add colors and patterns at the end; they are always part of the design process. We don't design a table and then decide to make it red. We start with the red! You can see it in the glasses for "Total Table" too: The lines that are on the glasses now come from the adhesive strips we used for the models. In the finished textiles too, you can still see the Scotch Tape we used for the paper models and the fluorescent paint we applied in-between. So you always also want to tell the design story in your works? Stefan Scholten: With our boxes "Butte", which we made for the Zuiderzee Museum and have now made for Established & Sons, we do indeed tell stories. They are travel boxes that fishermen used from the 16th/17th centuries to transport their personal belongings. They were painted with whales or polar bears, which the fishermen saw on their journeys. We redesigned the shapes and colors and painted stories from our time on the boxes, about endangered plants or animals. Now the tuna fish is endangered, maybe because we all eat too much sushi. There is a box with the story of a tree or a tortoise which is made into a glasses frame. It is perhaps a gentle way to show people that we think about these kinds of things too, even if the drawings are very graphic, for example, you see a tuna sandwich, the machine that cuts the tortoise into pieces, with its eggs collected for use as aphrodisiacs etc. Your cabinet for Established & Sons also has a historical forerunner. Stefan Scholten: Yes, it is inspired by a "Marker kast" from the 17th century. Marken is a small fishing town in the north of the country. The cabinet was painted with flowers, such as tulips, and became a symbol of the wealth of its owner. It didn't change from 1650 to 1800. We really like this kind of furniture, kept the dimensions and actually only chose a different material and redesigned the surfaces together with the company Abet Laminati. We had already designed this cabinet for the Zuiderzee Museum and Established & Sons asked us to redesign it for production. Who did the still lifes on the insides of the doors? Stefan Scholten: We got Scheltens & Abeness, known for their still lifes, on board for that. They arranged still lifes in our prototype and took photos of it. Originally, the cabinets had round wooden feet. We replaced those however with our glass jugs for Thomas Eyck, just without the handle and spout. Your "Colour Plaids" were your first commercially successful product. There are photos on your Website in which they cover design classics like the Eames Lounge Chair, Jacobsen Egg Chair and Panton Chair. Is this your way of saying that these classics could do with a makeover? Stefan Scholten: You've said it! I like that interpretation (laughs). 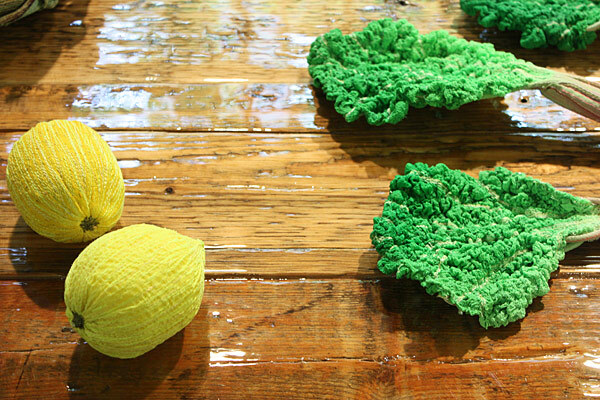 The blankets are something like "splashes of color", very simple products that completely change an interior. We only had the idea to cover design classics with them at the photo shoot. But now, funnily enough, even Vitra uses the photos. The idea was that you don't necessarily have to buy a new chair when you want something new. But now there are even manufacturers who ask us why we don't sell the chair and plaid together. 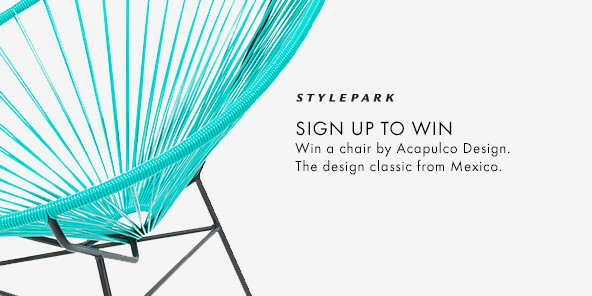 Your approach seems different to Droog Design's emphatically ironic, concept-laden method. Do you think those days are gone? Stefan Scholten: Gijs Bakker, one of the co-founders of Droog, was my university lecturer. We got on very well, but not in terms of design. He once said to me: "You are not a Droog designer" and he was right. Absurdly, 20 years later our products feature in a Droog shop in the States. But of course, Droog is not just about gimmicks either: the method of starting with a clear concept is the main reason we design like we do today. We can't just start with a joke and then a completely different idea for the next design. We live and work together; our design is about our life, the things we like. Naturally it is very personal, you have to like that. Carole Baijings: We also see this in our teaching activities. We really can tell which students have their own studio, because you notice when they find their independence, their authenticity. We try to show them tools and methods they can use. It is lovely to see people really using them and producing strong, independent results. That is a new kind of approach that perhaps will take on more significance in general. Stefan Scholten: I'm still pondering the idea of "superficiality": I think that one reason there is a market for this kind of design is that people still want to see the designer's signature. 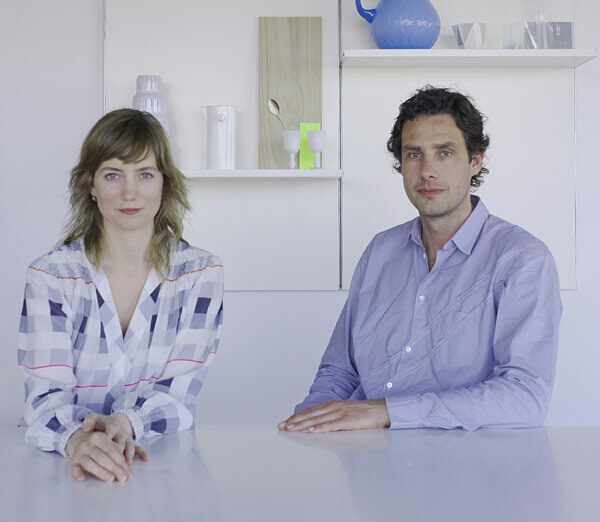 Hella Jongerius and Jurgen Bey started as Droog designers, but are now completely independent. They all belong to a group of designers who design because they feel a need to: they like particular things and make that fact public. In recent years it seemed as though all young designers had started designing in the "Droog style", as though they had all studied in Eindhoven. But who wants to live in an apartment full of ironic Droog designs? Stefan Scholten: Recently we have visited many exhibitions by somewhat Minimalist designers, such as the Konstantin Grcic exhibition in London and the one by Jasper Morrison, who I think is an outstanding designer. Yet even here I have the feeling that I would not like to live in this surreal world with absolutely no decoration. There has to be a mix. Based on the forms of our works, I also consider us Minimalist designers. Do you follow, with your various designs, the idea of a total interior-design artwork? Carole Baijings: In a few years our various designs could indeed become a total artwork. It is an excerpt from your own world, the way you work. I am sure that if you were to visit our house, you would think it a total artwork. Stefan Scholten: All cultures and tribal peoples show an excerpt from the world they live in with their handcrafted works. With our designs, we focus on what we like at the time. They represent a certain stage in life; it is not about clients. I recently read the perfect definition of it: When you design all these things, in the end you just want to show you are alive.